The "Epitome of Native Gods" (土着神の頂点). Extra Stage boss of Touhou game number 10, Mountain of Faith and later a playable character in Touhou 12.3 Hisoutensoku. Mountain goddess and original patron deity of the Moriya Shrine before losing it to Yasaka Kanako, but has remained a fixture in the shrine. She has the power to create earth. Direct ancestor of the shrine's miko, Kochiya Sanae. 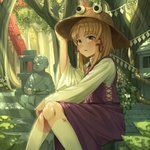 Suwako joined Sanae and Kanako upon moving into Gensoukyou, although she is less troubled by the waning faith of people from the outside world than the latter two. 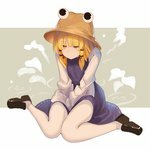 "Suwako is a god that takes the form of a frog". Her dress, her move in Hisoutensoku, and fanarts heavily depict this fact. This led to Kanako adopting snakes as her motif, symbolizing her victory over Suwako. Her hat has almost become an entity of its own in fanarts, due to the imposing, leering eyes on top of it. The following tags are aliased to this tag: /ms (learn more).